Faith Based Creative/Art Workshops for your ladies group or retreat. Classes include bible lessons as well as hands on projects. Let's get together to paint, explore, relax and be silly. Join with your sisters in Christ in a relaxing atmosphere to explore your story and all the unique things which make you, you. God has great things in store, will you join the adventure? To inquire about having Shelley teach any workshops for your group please use the contact form at the bottom of this page. 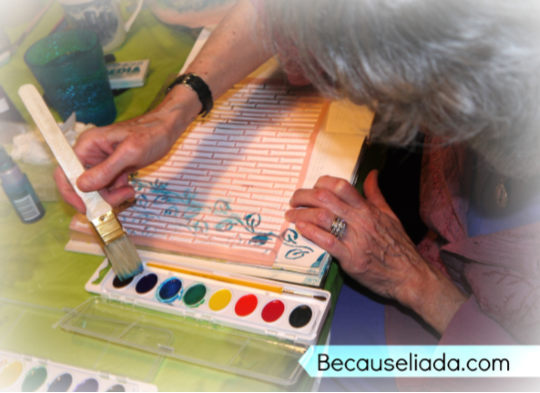 Workshops can take place in a home, church, retreat or other setting. Be Brave walks participants through a process of discovery to learn about themselves and the abundant life God has in store for them. This workshop which is personally taught by Shelley, has up to 6 lessons and can be adjusted to fit the scheduling needs of your group. It is perfect for a retreat or multi day workshop. If you would like to plan something at your church for your ladies group, Shelley can come and teach this hands on workshop. This mixed media workshop has a scriptural lesson as well as a creative hands on project with each lesson. Each participant will create their very own keepsake mixed media journal about themselves using a variety of art mediums and supplies. Participants need not have any prior artistic experience. Up to 6 lessons. Here are some photos and a video from some recent workshops. Many people do not even know what gifts the Lord has given them. Participants of this class will create a mixed media collage while considering their gifts and the things they are passionate about. We'll also consider how those things work in God's plan for each of our lives.